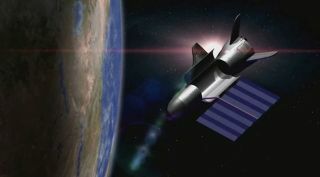 An artist's depiction of the U.S. Air Force's unmanned X-37B space plane in orbit with its solar array deployed and payload bay open. The latest secretive mission of the United States Air Force's X-37B space plane has cruised beyond 500 days in Earth orbit since its launch last year. Artist's illustration of the U.S. Air Force's X-37B robotic space plane orbiting Earth. Exactly what the winged space plane's duties are while it's in orbit continues to remain a tight-lipped affair. Similarly, how long the vehicle will remain in orbit has not been detailed. The first OTV mission launched in April 22, 2010, and concluded on Dec. 3, 2010, after 224 days in orbit. The second OTV mission — which used a different vehicle than the first — began March 5, 2011, and concluded on June 16, 2012, after 468 days on orbit. The subsequent OTV-3 mission reused the X-37B that flew on the first mission, and chalked up nearly 675 days in orbit. So far, the U.S. military has not stated where the OTV-4 mission's craft will ultimately land once it's current flight ends. In the past, all three X-37B flights ended at Vandenberg Air Force Base in California, gliding to a runway landing on autopilot. New landing site for X-37B? Progress has been made, however, to consolidate its space plane operations, including use of NASA's Kennedy Space Center (KSC) in Florida as a landing site for the X-37B. A former KSC space-shuttle facility known as Orbiter Processing Facility (OPF-1) was converted into a structure that will enable the Air Force "to efficiently land, recover, refurbish and relaunch the X-37B Orbital Test Vehicle (OTV)," according to Boeing representatives. The X-37B vehicle development falls under the Boeing Space and Intelligence Systems in El Segundo, California, the firm's center for all space and experimental systems and government and commercial satellites. The Air Force Rapid Capabilities Office is leading the Department of Defense's OTV initiative, by direction of the Under Secretary of Defense for Acquisition, Technology and Logistics and the Secretary of the Air Force. Only two reusable X-37B vehicles have been confirmed as constituting the fleet. This current OTV-4 trek is the second flight of the second X-37B vehicle built for the Air Force by Boeing. The reusable X-37B military space plane looks like a miniature adaptation of NASA's now-retired space shuttle orbiter. The space plane is 29 feet (8.8 meters) long and 9.6 feet (2.9 m) tall, and has a wingspan of nearly 15 feet (4.6 m). The space drone has a payload bay about the size of a pickup truck bed. It has a launch weight of 11,000 lbs. (4,990 kilograms) and is powered on orbit gallium arsenide solar cells with lithium-ion batteries. A few payloads onboard the OTV-4 craft have been identified. Aerojet Rocketdyne has announced that its XR-5A Hall Thruster had completed initial on-orbit validation testing onboard the X-37B space plane. It is also known that the vehicle carries a NASA advanced materials investigation, as well as an experimental propulsion system developed by the Air Force. "It remains a very useful way to test out things," Winston Beauchamp, deputy undersecretary of the Air Force for Space told Inside Outer Space during last month's American Institute of Aeronautics and Astronautics (AIAA) meeting in Long Beach, California. Asked about any interest in increasing the X-37B fleet size, Beauchamp said that the number of vehicles currently in use is fine due to the pace of experiments it conducts. Leonard David is author of "Mars: Our Future on the Red Planet," to be published by National Geographic this October. The book is a companion to the National Geographic Channel six-part series coming in November. A longtime writer for Space.com, David has been reporting on the space industry for more than five decades. Follow us @Spacedotcom, Facebook or Google+. Story published on Space.com.